Combine the water, yeast and sugar in a small bowl. Set aside for 5 minutes or until foamy. Combine the flour and salt in a large bowl and make a well in the centre. Add the yeast mixture and oil. Use a round-bladed knife in a cutting motion to mix until the mixture is combined. Use your hands to bring the dough together in the bowl. Brush a bowl lightly with oil. Turn the dough onto a lightly floured surface and knead for 10 minutes or until smooth and elastic. Place in the prepared bowl and turn to coat in oil. Cover with plastic wrap and set aside in a warm, draught-free place to rise for 30 minutes or until dough doubles in size. Dust work surface with flour. Knead dough and form into a long cylinder. Divide into thirds and use a rolling pin to roll each third into a 20cm disc. Bake at 180 degrees for 20 minutes or until cooked. 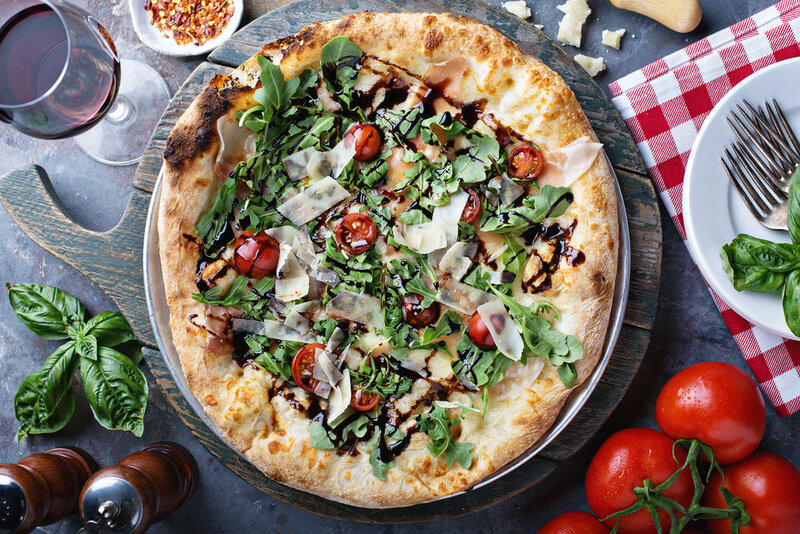 Drizzle some olive oil on the pizza base, and add chopped cherry tomatoes, rocket, parmesan and drizzle your favourite Sticky Balsamic on top ( we love Sticky Balsamic Premium Fig, Sticky Balsamic Pear or Sticky Balsamic Original for this recipe).